First Step in Annihilation to the Muhammadan Reality is to realize that We are so insignificant; just a Dot in the Oceans of Power Under the Ba (ب). Each page of the book you hold in your hand comprises billions of atoms. Atoms are particles so minute that it is impossible to view one even with the most powerful microscopes. The diameter of an atom is only of the order of one millionth of a millimeter. Think that you have a key in your hand. No doubt, it is impossible for you to see the atoms in this key. If you say you must see the atoms, then you have to magnify the key in your hand to the proportions of the world. Once the key in your hand becomes as large as the earth, then each atom inside the key is the size of a cherry. Let us suppose that we want to count all the atoms in a single grain of salt and let us assume that we are able to count one billion (1,000,000,000) atoms per second. Despite our considerable deftness, we would need over five hundred years to count the number of atoms inside this tiny grain of salt. What, then is there inside such a small structure? Despite its exceedingly small size, there is a flawless, unique and complex system inside the atom comparable in sophistication to the system we see in the universe at large. Each atom is made up of a nucleus and a number of electrons moving in orbital shells at great distances from the nucleus. Inside the nucleus are other particles called protons and neutrons. In this chapter, we will look at the extraordinary structure of the atom that constitutes the basis of everything animate and inanimate, and see how the atoms combine to form molecules and ultimately, matter. The nucleus is located right at the center of the atom and is made up of a certain number of protons and neutrons depending on the properties of that atom. The radius of the nucleus is about ten thousandth of the radius of the atom. To express that in numbers, the radius of the atom is 10-8 (0.00000001) cm, the radius of the nucleus is 10-12 (0.000000000001) cm. Therefore, the volume of the nucleus is equal to a ten billionth of the volume of the atom. Let us take our example of the cherry. Let us look for the nucleus inside the atoms that we had visualized as the size of cherries when the key in your hand was magnified to be the size of the earth. But such a search would be inconclusive because even at that scale, it is absolutely impossible for us to view the nucleus, which is still exceedingly small. If we really want to see it, then we would have to change the scale again. The cherry representing our atom must again expand and become a large ball, two hundred meters in diameter. Even at this unbelievable scale, the nucleus of our atom would not become any bigger than a very tiny grain of dust. So much so that when we compare the diameter of the nucleus that is 10-13 cm and the diameter of the atom that is 10-8 cm, we come to the following result: if we assume the atom to be a sphere, if we wished to fill this sphere totally with nuclei, then we would need 1015 (1,000,000,000,000,000) nuclei to fill it. although its size is one ten billionth of an atom’s size, the nucleus’ mass comprises 99.95% of the mass of the atom. How is it that something constitutes almost all of a given mass, while, on the other hand, occupying almost no space? The reason is that the density comprising the mass of the atom is not distributed evenly throughout the whole atom. That is, almost the entire mass of the atom is accumulated in the nucleus. Say, you have a house of 10 billion square meters and you have to put all the furniture in the house in a room of one square meter. Can you do this? Of course you cannot. Yet, the atomic nucleus is able to do this thanks to a tremendous force, unlike any other force in the universe. This force is the “strong nuclear force”, one of the four fundamental forces in the universe we mentioned in the previous chapter. We had noted that this force, the most powerful of the forces in nature, keeps the nucleus of an atom intact and keeps it from fragmenting. All the protons in the nucleus have positive charges and they repel each other because of the electromagnetic force. However, due to the strong nuclear force, which is 100 times stronger than the repulsive force of the protons, the electromagnetic force becomes ineffective, and thus the protons are held together. To sum up, there are two great forces interacting with each other, inside an atom so small as to be unseen to us. The nucleus is able to stay together as a whole owing to the precise values of these forces. When we consider the size of the atom and the number of atoms in the universe, it is impossible to fail to notice that there is tremendous equilibrium and design at work. It is crystal clear that the fundamental forces in the universe have been created in a very special way with great wisdom and power. The only thing those who reject faith resort to is nothing other than claiming that all of these came into being as a result of “coincidences”. Probabilistic calculations, however, scientifically put the probability of the equilibrium in the universe being formed “coincidentally” at “0”. All these are clear evidence of the existence of Allah and the perfection of His creation. Why is there such space? Let us think. In simple terms, the atom consists of a nucleus, around which electrons revolve. There is nothing else between the nucleus and the electrons. This microscopic distance “in which nothing exists” is in fact a very large one on the atomic scale. The nucleus would be one kilometer away from this marble. There is a great space lying between the basic particles. then the electron revolving around it draws a circle passing through Holland, Germany and Spain (The writer of these lines lives in France). You would actually never be able to see me with the naked eye. I would be as small as a tiny dust particle of the size of a several thousandth of a millimeter. At this point, we realize that there is a similarity between the largest and the smallest spaces known in the universe. When we turn our eyes to the stars, there again we see a void similar to that in the atoms. There are voids of billions of kilometers both between the stars and between the galaxies. Yet, in both of these voids, an order that is beyond the understanding of human mind prevails. Until 1932, it was thought that the nucleus only consisted of protons and electrons. It was discovered then that there are not electrons but neutrons in the nucleus besides the protons. (The renowned scientist Chadwick proved in 1932 the existence of neutrons in the nucleus and he was awarded a Noble Prize for his discovery). Mankind was introduced to the real structure of the atom only at such a recent date. We had mentioned before how small is the nucleus of the atom. The size of a proton that is able to fit in the atomic nucleus is 10-15 meters. You may think that such a small particle would not have any meaning in one’s life. However, these particles that are so small as to be incomprehensible by the human mind form the basis of everything you see around you. The entire universe, our earth, and all animate and inanimate beings are formed by the arrangement of these 109 elements in various combinations. Thus far, we saw that all elements are made up of atoms that are similar to each other, which, in turn are made up of the same particles. So, if all the atoms constituting the elements are made up of the same particles, what then is it that makes the elements different from each other and causes the formation of infinitely diverse matters? It is the number of protons in the nuclei of the atoms that principally differentiates the elements from each other. 26 protons in the iron atom. What differentiates gold from iron and iron from oxygen is simply the different numbers of protons in their atoms. Until 20 years ago, it was believed that the smallest particles making up the atoms were protons and neutrons. Yet, most recently, it has been discovered that there are much smaller particles in the atom, that form the above-mentioned particles. This discovery led to the development of a branch of physics called “Particle Physics”; investigating the “sub-particles” within the atom and their particular movements. Research conducted by particle physics revealed that the protons and neutrons making up the atom are actually formed of sub-particles called “quarks”. The dimension of the quarks that form the proton, which is so small as to exceed the capabilities of human imagination, is much more astounding: 10-18 (0.000000000000000001) meters. The quarks inside a proton can never be pulled apart from each other very much because the “strong nuclear force” that is responsible for keeping the particles inside the nucleus together operates here as well. This force serves as a rubber band between the quarks. As the distance between the quarks increases, so does this force. Two quarks cannot become more distant from each other than a quadrillion of a meter. These rubber bands between the quarks are formed by gluon that possess the strong nuclear force. The quarks and the gluon have a very strong interaction. However, scientists have not yet been able to discover how this interaction takes place. Research is underway in the field of “Particle Physics” to unravel the world of sub-atomic particles. Yet, despite all the intellect, consciousness and knowledge mankind possesses, we have only recently been able to discover the very basic particles forming everything, including ourselves. Further, the more we delve into these particles, the more detailed the subject becomes, leaving us in the lurch at the limit of the 10-18 m dimension of the quark. What lies beyond this limit? Today, scientists propound various hypotheses on this subject, but as mentioned above, this limit is the furthest point hitherto reached in the material universe. Everything beyond that point can only be expressed as energy, not as matter. The really important point is that man finds, in a location that he has only just been able to discover with all the technological means at his disposal, enormous balances and the laws of physics already running like a clock. Furthermore, this location is inside the atom, which constitutes the building block of all matter in the universe, as well as of human beings. Man has just started to become aware of the perfect mechanism functioning without fail in the organs and systems in his own body. His discovery of the mechanisms of the cells forming these structures goes back only a few decades. The supreme creation evident in the atoms lying at the basis of cells, the protons and neutrons in the atoms, and the quarks in these particle is so perfect as to stagger everyone, be him believer or not. The basic point to be pondered here is that all of these perfect mechanisms run in an orderly fashion every second throughout man’s life, without any intervention by him, and totally outside his control. It is very self-evident fact to everyone who uses his conscience and wisdom that all of these have been created by Allah, Owner of superior power and knowledge, and are governed by Him. This rotation, like that of the planets, is realized ceaselessly and in perfect order on paths we call orbits. Yet, the proportion of the size of the earth and the sun is very different from the atomic scale. To make a comparison between the size of electrons and the size of the earth, if we enlarge an atom as big as the earth, the electron would be in the size of an apple. Tens of electrons revolving in an area so small as to be invisible even to the most powerful microscopes create a very complex traffic inside the atom. The most remarkable point here is that these electrons surrounding the nucleus like an armour of electrical charge do not have even a small accident. In fact, any small accident inside the atom would cause a disaster for the atom. However, such an accident never takes place. The whole operation runs flawlessly. The electrons revolving around the nucleus at the mind-boggling speed of 1,000 km/second never collide with each other. It is extremely amazing that these electrons, which are no different from each other, follow separate orbits, and it is obviously the result of a “conscious creation”. 36:40 It is not permitted to the Sun to catch up the Moon, nor can the Night outstrip the Day: Each (just) swims along in (its own) orbit (according to Law). If they had different masses and velocities, it might be natural for them to settle in different orbits around the nucleus. For instance, the order of the planets in our solar system follows this logic. Planets that have totally different masses and velocities are naturally settled in different orbits around the sun. But the case with the electrons in the atom is totally different from that of these planets. The electrons are exactly alike but have different orbits around the nucleus: how do they follow these paths unerringly, how do they not collide though they have incredibly small dimensions and move at incredible speeds? These questions lead us to a single point: the only truth we face in this unique order and delicate equilibrium is the perfect creation of Allah. 59:24 He is Allah-the Creator, the Maker, the Giver of Form. To Him belong the Most Beautiful Names. Everything in the heavens and earth glorifies Him. He is the Almighty, the All-Wise. Electrons are small particles, almost two thousandth the size of neutrons and protons. An atom has the same number of electrons as protons and each electron bears a negative (-) charge equal to the positive (+) charge borne by each proton. The total positive (+) charge in the nucleus and the total negative (-) charge of the electrons cancel each other and the atom becomes neutral. The electric charge they carry obliges electrons to obey certain laws of physics. One of these laws of physics is that “same electrical charges repel each other and opposite charges attract each other”. First, under normal circumstances, the electrons, all negatively charged, would be expected to repel each other by obeying this rule and shoot away from the nucleus. Yet, this does not happen. If the electrons were scattered from the nucleus, then the universe would consist of idle protons, neutrons and electrons wandering in the void. Second, the positively charged nucleus would be expected to attract the negative charged electrons and the electrons would stick to the nucleus. In that case, the nucleus would attract all the electrons and the atom would implode. However, none of these things occur. 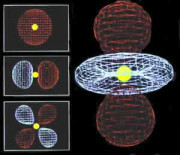 The above-mentioned extraordinary escape velocities of the electrons (1,000 km/sec), the repelling force they exert on each other and the force of attraction the nucleus exerts on the electrons are based on such precise values that these three contradicting factors perfectly balance each other. As a result, this outstanding system inside the atom runs without falling apart. Even if a single one of these forces impinging on the atom were a little bit more or less than it has to be, the atom would never exist. In addition to these factors, if the nuclear forces binding protons and neutrons in the nucleus to each other did not exist, protons having equal charges could not even come close to each other, much less bond together in a nucleus. In the same manner, the neutrons would never be able to stick to the nucleus. As a result, there would be no nucleus and therefore, no atom. All these fine calculations are indications that even a single atom is not idle but acts under the perfect control of Allah. Otherwise, it would be inevitable that the universe we live in would end before it started. This process would backfire at the outset and the universe would not form. However, Allah, the Creator of everything, the Omnipotent and the Almighty, established extremely precise equilibrium inside the atom just as He established all the balances in the universe, thanks to which the atom continues to exist in perfect order. Why do these forces act at certain intensities under certain rules? Why do the domains that are governed by these forces, the rules they obey, and the intensity of these forces have such great harmony? Scientists were desperate in the face of all these questions because all they can do is guess at the order in which the events take place. Their research, however, gave rise to an indisputable reality. Every point in the universe reveals the intervention of an Owner of intellect and Will Who does not leave even a single atom idle. There is a single power that holds all forces together in harmony, and that is Allah; Who holds all the power and might. Allah manifests His might wherever He wills, whenever He wills. The entire universe from the smallest atom to the endless galaxies is able to continue its existence only by Allah’s will and preservation. In the Qur’an, Allah states that there is no power but Him and He announces the punishment of those who, unaware of this, assume that the powerless beings (animate or inanimate) He created have power and strength independently of Him, and attribute divine characteristics to them. So far no scientist has yet been able to explain the cause and source of the forces in the atom and therefore in the universe, and why certain forces come into play on certain occasions. What science does is only to make observations, take measurements and designate “names” for them. Such “namings” are regarded as great discoveries in the world of science. In fact, what scientists do is not an attempt to form a new equilibrium in the universe or build a new system but just an effort to comprehend and unravel the secret of the evident equilibrium in the cosmos. What they mostly do is simply observe one of the countless wonders of Allah’s creation in the universe and assigning a name to it. Scientists detecting a superior system or structure created by Allah are awarded various scientific prizes, honored and admired by other people. In this case, the one who really should be honored is, without doubt, Allah, the Most Gracious, the Most Merciful, Who brought that system into being when it was not, furnished it with exceedingly delicate balances, and endlessly creates extraordinary miracles the like of them. Electrons follow an extremely complex orbit within the atom. Although a much more crowded environment than city traffic is formed in such a small place, not even one accident takes place. Tens of electrons, which spin and orbit in an area unobservable even by the most powerful microscopes, create an extremely complex traffic inside the atom as we mentioned earlier. This traffic, however, is so orderly as to be incomparably more orderly than the most systematic city traffic. Electrons never collide with each other, because each electron has a separate orbit and these orbits never coincide. There are 7 [7 Levels of Heart] electron shells around the nucleus of the atom. 7 days of the week around them. The numbers of electrons in these seven electron shells that never change have been specified by a mathematical formula: 2n2. The maximum numbers of electrons that can be present in each electron shell around the atom have been fixed by this formula. (The letter n in the formula shows the electron shell number). That the endless number of electron shells of atoms making up the universe precisely stick to the same number by obeying the 2n2 formula indicates order. That no chaos occurs inside the atom although the electrons move about at incredible speeds is a further indication of this unique order. This is an order that can by no means be attributed to coincidence. The only explanation for the existence of this order is that Allah created everything as a manifestation of His power in an order and harmony as told in the Qur’an.